The classic retro beauty from Mahindra is all set to zoom in the ever expanding Indian Auto market at a price tag of Rs 6 to 8 Lakh. Mahindra Thar, the exciting model from Indian Automobile manufacturer is designed to remind the mythological jeep feel to the Indians. The all new Gypsy, Mahindra Thar will make its grand entry in Indian markets tomorrow, 21st December 2010. The first two states to welcome the traditional beauty is none other than top tourist destination, Rajasthan and Kerela. Mahindra Thar is a model from Mahindra which is existing already in the South African and European auto market. Mahindra is coming up with this powerful and aggressive model to delight all the jeep aficionados in India. See More Mahindra Thar Pictures&nbsp&nbsp&nbsp&nbsp&nbsp&nbsp Read More on Mahindra Thar Mahindra Thar is designed to give the best off-road experience and that what makes it a perfect carrier for the tourist industry. The jeep following its age long traditions, is built on open roof concept and gives the royal inherent feel. The industry sources say that Mahindra & Mahindra designed this powerful model only for the foreign markets but owing to its exponential demand they planned its appearance in domestic market as well. The Mahindra Thar will bring back the marvelous memories of Mahindra MM540 and Mahindra MM550 thus shouldering the tradition of its ancestors. The jeep is sure to gain high demand in Indian auto market as it holds the brand name Mahindra which is visible on Jeeps since ages. Country has come through many decades ahead and has faced storms of changing fashions but the aroma of a jeep has never reduced, it remains the favourite of many users. 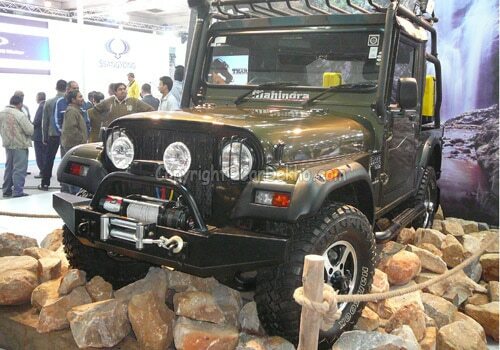 The royal Mahindra Thar will take peoples heart with the shock bearing capability and strength. The driver can feel safe with the jeep as it will go on irrespective of road conditions. The striking grace gets its enumerable power from 2.5 litre CRDe powertrain mated with 5 speed manual transmission, which again takes you to the glorious past. The engine is built top give a peak power of 105 BHP @ 3800 rpm thus making it an unchained devil on roads.